In Travel Mosaics: A Paris Tour, explore the beauty of France while completing colorful and challenging mosaics puzzles. It’s edutainment for all ages! Follow the Walkers, a fun animal family, as they tour the most famous attractions Paris has to offer. Answer tricky quiz questions, collect gold coins and find incredible souvenirs during your trip. Travel Mosaics: A Paris Tour is perfect if you’d like to exercise your mind and have fun at the same time. 140 clever and colorful mosaics puzzles! Travel Mosaics: A Paris Tour is rated 3.5 out of 5 by 23. Rated 4 out of 5 by taurgem52 from Challenging This is my first time giving a review. I found this Mosaic challenging because of the black on black fill-in squares. I actually played the 60 minutes free and then I bought the game. Rated 3 out of 5 by grandmacathy from Just ok I love the griddler games! I get excited when I see a new one. I like the other major developers' games but also look forward to new types with hopefully more fun variations. So I started this game with a hopeful and open mind. I only played for 35 minutes and then I quit. The black grid is kind of weird, as it is hard to determine which tiles are still available and which ones are filled with the black dot. I could get used to it. The colors of the various levels are pretty, with a 3-D impression. I don't always know what the picture is supposed to be, and there is no title that I could see. Another minor thing I could ignore. Not always a logic game, so sometimes I had to guess or use a hint. I pride myself on solving the griddler games without using a hint, so this is a major problem for me. The worst part is that I had to get a certain number of stars in order to progress to the next level. Seeing as the logic is missing and I don't like to use hints, I didn't get 3 stars in all the games on the first level. So I ran out of lives. Then I was given a question about the size of the garden in order to proceed. This answer might be in the beginning but I didn't remember seeing it. Finally, this game falls short of enjoyable for me for 3 reasons - I cannot use only logic to complete the levels; I had limited number of lives to play the game; and it was hard to see the dots in the squares without colors. Rated 3 out of 5 by kerith90angel from It would have been good with some improvements Based on the completed demo The other 2 reviews have summed it up perfectly. The dark background is blended with the "working areas" of the grids and it makes it hard to tell where you are. I play with a large screen monitor, so on a smaller computer this would be even worse. By the 4th grid, the numbers are too small to get most new players to this genre off and running without getting frustrated. I also had trouble applying the bonus upgrades until I realized they needed to "fill up". I was really annoyed by the 6th grid that I had to replay the previous grids with 2 stars to move on. I'd already had to replay a couple of the levels due to "guessing" with a few misfires. I really disliked the music, it loops and I shut it off finally. I did like all the sound effects to this game and the way it would highlight sections of a picture once you completed an area. This is a good, not great, grid game. There are just better ones to spend your money on so I'd highly suggest a demo before purchase. And one last thing.... What is up with Momma panther character? She appears to have a chill husband and children (with normal clothing on) so why is she wearing a tight tank top and daisy dukes? I'm not a prude but it certainly didn't fit this game. Rated 3 out of 5 by lvd04 from disappointing I love these mosaic games and this had potential. The colors are vivid. But I agree with the other 2 reviews. The black on black hurts my eyes and I get a headache from squinting to see which squares are blocked off. I spent about 15 minutes playing this before I had to quit. Rated 3 out of 5 by jete77 from F The presentation of this game looks great, and I was looking forward to liking/buying the game. However, the background is black with black dots for taken cells and it's very hard to see the available cells to choose from in the daylight. I'm not sure how it will look at night with the lights on, but I'm not optimistic about it. That I could see, there wasn't any options for choosing a different background either; I'm disappointed because it looks like a great game. Rated 3 out of 5 by Daxadillion from Just OK as far as I'm concerned. Good Points: It looks like there are up to 5 bright colours, although that might increase as the levels become harder. You can choose to play in either Easy or Difficult. The music is ok, although I usually turn it off after a while. Bad Points: In the Instructions section says "Guess and Fill". The background on the grid is black and the auto-fill is also black which makes it more difficult to see if the squares have been filled or not. After completing 8 levels with 3 stars a box popped up saying "Complete 6 levels with 2 stars to unblock the Bonus levels". I doubt I will be buying this one. Rated 2 out of 5 by xRamx from Many Levels Without Challenge Way too many seemed like paint by the numbers! Rated 2 out of 5 by arnold1049 from NO ROOM FOR ERROR In order to achieve 3 stars for a board, you cannot make a mistake or use any of the 4 bonuses for help. So why are bonuses even available and, secondly, why would you want to use any of the "money" you earn to upgrade the bonuses when their use removes a star? I can't imagine very many people who play a game intending to make mistakes or use bonuses when both of these actions result in losing a star. It makes absolutely no sense. Thankfully, the mosaics aren't that hard to do using the Easy setting. I am at the fifth location out of 20, so this may change as I continue farther into the game. If the boards get to the point where they can't be solved without help, then I will quit the game and delete it. Why play if you have little or no possibility of obtaining perfection? To add another design flaw, most of the achievements are based on earning 3 stars, yet the game is designed to make this almost impossible. In addition to stars, there are also "lives" that "die" when you make a mistake. 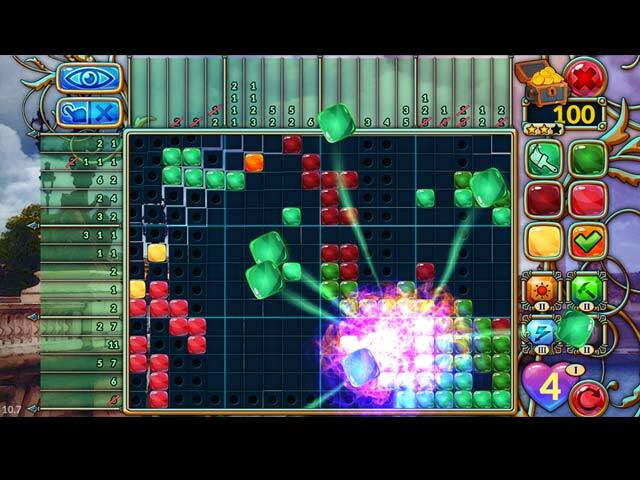 Each board starts with two lives available and more are added arbitrarily during game play. Lose too many lives and you have to start the board over. I have no clue how this adds to the enjoyment or challenge of the game; making mistakes eliminates stars, so how do lives mean anything? Three other things also detracted from the game. 1.The pulsing paint brushes for the colors give me a headache. 2.The numbers for the columns and rows were extremely hard to see. The background used for the numbers was the same color as the numbers, providing absolutely no contrast. For example, red numbers against a red background, blue numbers against a blue background, etc. 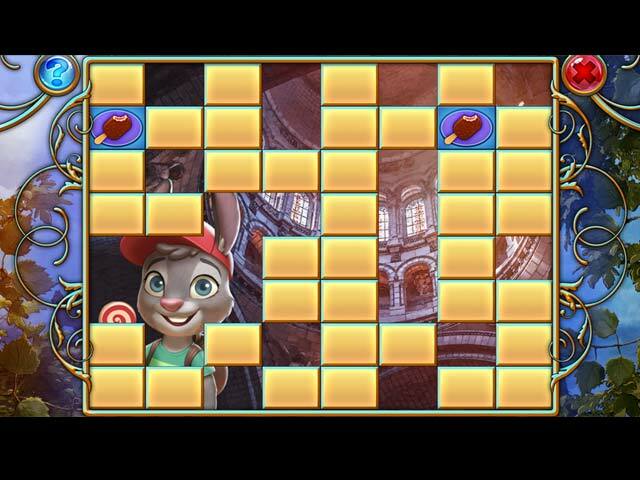 3.There is no skip option for the bonus puzzle, one for each of the 20 locations. If you can't finish the bonus puzzle, you can't advance to the next location. This is a poorly constructed, illogical game that sets you up for failure. Rated 2 out of 5 by verimeri from could have been good but.... This could have been a really good game. The mosaic colors are nice. However, that black on black background is just awful. Major eye strain. Also, even in the first few puzzles I found I had to use power-ups or guess. Rated 2 out of 5 by lamp_post from Black on Black I love griddlers or whatever you choose to call them, but I found this one to be very hard on my eyes. It is black background with black in unfilled spaces and for some reason it hurt my eyesight....goes to say....without saying....I am old. lol I could not tell what the finished picture was suppose to be which is another turn off. But, please try this and hopefully it will be the game for you. Rated 2 out of 5 by pennmom36 from A "GUESSER" GRIDDLER WITH HARD TO SEE GRIDS This game has two major strikes against it..Some of the levels aren't based upon logic, requiring you to either guess or use a Power-up to solve it. The second strike is that the grids start out entirely black, and the crossed off squares are are also black, with a circle. This makes it really difficult to tell which squares are crossed off, and for me it became frustrating, as I tried to figure out where one square stopped and another started. It's too bad that these two flaws exist, because otherwise this would be an awesome Griddler that has otherwise some good features. The filled in squares are colorful, and look like 3D bubbles. 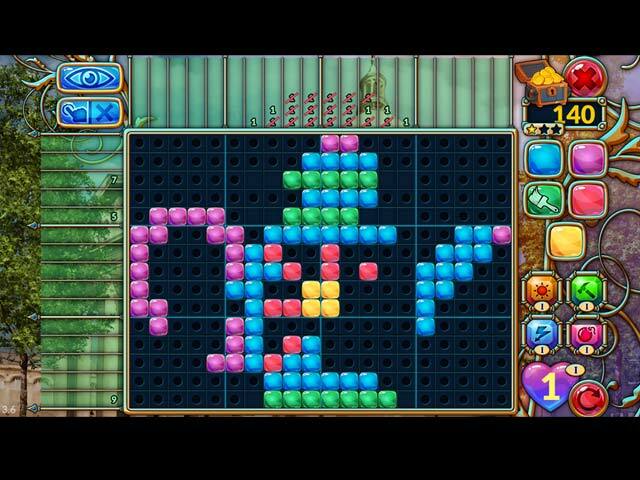 You can play in an Easy mode which crosses off one by one or Difficult mode which only crosses off squares when the entire row or column has been completed. I wasn't crazy about the music, but that's an easy fix. As you fill in tiles, you will earn coins, or Power-up recharges. Power-ups can be upgraded, and you can also buy Souvenir's. There are Power-ups such asa Hammer, Sun, Lightning and even a Bomb, they start out with very little coverage area which increases with each upgrade. Each Location has 6 main levels, 1 bonus level and 1 additional puzzle. You must earn at least 2 Stars on each mail level to open the bonus puzzles, and you have to earn at least 1 Star in each of the main levels to unlock the next location. There is a Book icon that gives a brief description of the locations, which comes in handy if you make too many mistakes, because you will be asked some questions about the locations as a chance to earn another chance. Rated 1 out of 5 by jey12345 from Worst nonogram yet I love, love, love nonogram/mosaic puzzles! There are very few that are of good quality, though. With most, you end up having to guess a square or two, rather than using logic through the whole puzzle. I'm okay with a guess here and there, but this one? Good grief. I didn't even make it 5 minutes into the trial version before uninstalling because the entire board would have been guesses. Another thing that I hated about this game is that there's no option to have it cross off all the unmarked spots in a row once you've marked all colored spots. You have to manually go through and right click all empty boxes on every.single.color. What a waste of time!!! Rated 1 out of 5 by kateblue222 from can't see the grid The black on black grid to show which squares should not be marked was too much for me. Couldn't see it properly. Deleted. 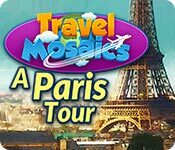 In Travel Mosaics: A Paris Tour, explore the beauty of France while completing colorful and challenging mosaics puzzles.